Time moves on. Distros move on, and so again it’s time to install Citrix Receiver for Linux. They have moved on to version 13.1, which fixes a lot of install bugs in the Ubuntu version. Unfortunately that seems to be at the cost of the RPM version which is no longer available. In this post we will be installing it on Fedora 21 which is still in beta. Get the software Receiver for Linux 13.1 and look for For 64-bit Systems (assuming you have a 64 -bit system). Citrix Receiver for Linux 13.1.0 setup. Copyright 1996-2014 Citrix Systems, Inc. All rights reserved. Copyright (c) 1986-1997 RSA Security, Inc. All rights reserved. The parent directory /opt/Citrix does not exist. You have chosen to install Citrix Receiver for Linux 13.1.0 in /opt/Citrix/ICAClient. Quitting Citrix Receiver for Linux 13.1.0 setup. Unfortunately we are not out of the woods yet, as a quick check shows that we are missing some dependencies. Fortunately with the excellent yum installer we can just point to the missing files and it will install the required packages. 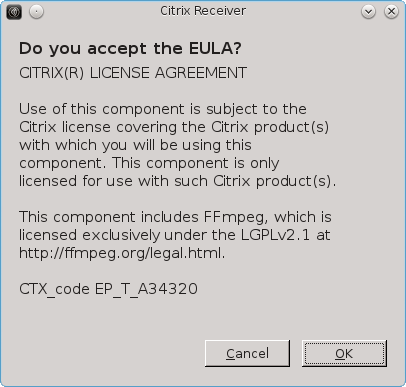 Once you log in to your companies web page and launch citrix you get a popup asking you to accept the license. 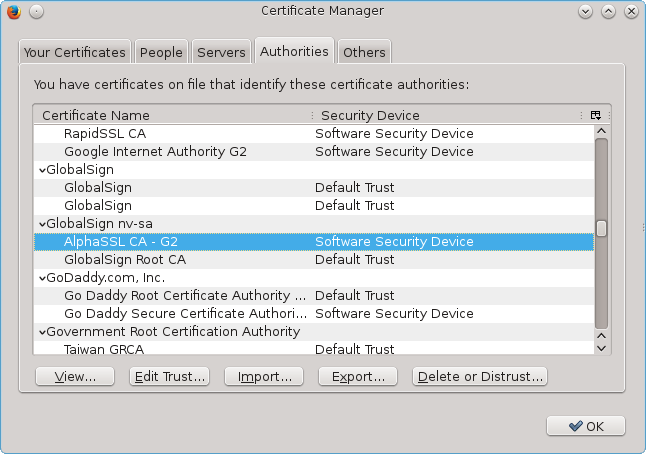 Citrix ships with a very small number of CA Root Certs. Therefore the chance is quite high that you will be presented with a signed cert from a CA provider that they do not have the root certificate for. If your server has signed their SSL/TSL cert with a missing root certificate you will be presented with the “SSL error 61” message that we have come to know and love. At this point I normally suggested using the certs from Firefox, but in the version of Firefox (32.0.2) shipped with Fedora 21 Beta, the root Certs are no longer kept as files on the disk. 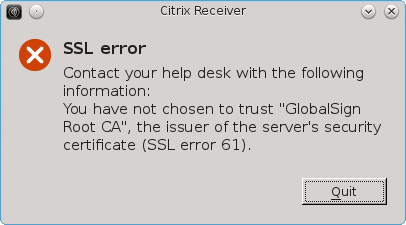 The error message actually tells you which one you are missing, in my case “Global Sign Root CA”. Now go to Firefox and open Edit > Preferences > Advanced > Certificates > View Certificates > Authorities, where you will be presented with a long list of Authorities. Scroll down to the Authority that issued your cert and starting at the top, export them one by one and save them to /opt/Citrix/ICAClient/keystore/cacerts/. I needed to save them in my own Downloads folder, and from there I moved them to the folder as root adding the pem extension. For me it turned out to be the third one and once I had it installed I was able to open the applications on my companies citrix web page. One improvement is that there is no warning about missing languages. Thank you for the installation instruction. Citrix is always a hit or miss on with fedora release. I followed your instructions and citrix “kinda” works. Hopefully you can clarify further. But if I launch it via the .desktop entry available in the gnome shell i get nothing. My question is: does citrix have a GUI of sorts? a client console per say? I recall older versions used to have this. I remember some sort of functionality like that a long time ago but I never spent the time to get it working. I usually just go to the web page, login and then click the icons from there. That opens the various different applications. Thank you very much for an excellent set of instructions. It worked perfectly with my Fedora 21. Thank you, thank you, thank you!!! I was using the instructions for installing on Ubuntu which worked for my desktop, but not for my laptop using F21 with Cinnamon. I used to be able to get it to work by installing some symbolic links and libpng12, but not on this laptop. Your help with the ldd command was exactly what I needed! Thanks so much again! Am relatively new to Linux/Fedora. Any guidance you can provide would be greatly appreciated! I can finally install Citrix Receiver in my fedora 21, but when I use command line to launc the ICA file y get this error. I don’t know if this is my company issue or citrix receiver. Have you seen this before? Thank you for this! It worked perfectly! If you do a directory listing using the command “ls” or “ls ~/Downloads/citrix/” you should see the file linuxx64-13.1.0.285639.tar.gz listed. Now extract the file using the command “tar xvf linuxx64-13.1.0.285639.tar.gz” and a listing of the directory should show the files. Regarding people getting the “Install libc-i386 package (or equivalent) and then retry” error, I got that as well. Some people were saying to install “glibc-devel.i686” but I tried that and still no luck. Then I came across the answer. I did that and it worked. Hopefully it works for others too. However, after I installed Citrix receiver, but it wouldn’t open. Also, when I try and launch Citrix applications from the web, nothing happens. I guess it could be certificate problems. I’ll try and work around it, but am not sure if I’ll ultimately get it working. Just a thank you note for the blog, helped me with my setup on Fedora 21. Thank you!!! I tried many methods to have Citrix working in Fedora and this post worked for me. 3. You have duplicate versions of gtk2 installed already. => should I force the install against the advise of Fedora ? but it doesn’t solve the problem! How to install it on Fedora 22? couldn’t find libc-i386 for Fedora 22!! Thank you very much! Saved me a ton of time. HM thanks a lot for the post!!! Those two missing dependencies is what I needed for my fedora 22 install. How were you able to identify those packages would solve the libc-i386 dependency? Running ‘dnf provides libc-i386’ yielded no results.